The Philadelphia police department created the term “Black Friday” in 1961 to describe the shopping induced chaos that occurred every Friday after Thanksgiving. Officers worked over-time directing traffic, helping accident victims, and making increased arrests. Merchants wanted a more positive term for the day, but they were too late, the name stuck. Cyber Monday is a marketing term for the first Monday after Thanksgiving. Marketing companies created the term in 2005 to create increased visibility for online shopping. A few short years later, it is an established form of retail marketing. More than 129 million Americans will take advantage of the online deals on Cyber Monday in 2014. 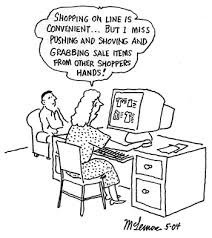 And, they will spend more money on Monday (average online spending is $194.46) than the previous four days of the Thanksgiving weekend (average online spending is $172.42). So who is winning, the brick & mortar merchants or the online merchants who may also have physical locations? Is Cyber Monday powerful enough to change the shopping habits of hundreds of millions of Americans? And, how will this impact our future? Will there be more Cyber Mondays? After more than 50 years, Black Friday does represent a certain amount of tradition: Christmas trees, store decorations, Santa Claus, extended hours, free gifts and substantial discounts. There is no Cyber Monday tradition when you sit in front of your computer in pajamas surfing the web for the best deals. Maybe you wear a Santa hat and drink eggnog while you shop. Stores offer big discounts because they have to. Discounts are the incentive that lures millions of Americans into shopping in the middle of the night, enduring traffic jams, parking long distances from stores, and standing in long lines to make purchases. Cyber Monday merchants offer discounts because they need traffic on their websites. Then they have the opportunity to sell their full price merchandise and increase profits. Unless the websites are poorly designed and dysfunctional, can you say Obamacare, the cyber merchants do not have many of the problems that are shared by the Black Friday merchants. Internet merchants have some huge marketing advantages over brick & mortar businesses. You can find what you are looking for in two minutes and you research the product in another two minutes. You found the product you wanted to buy and you have the information you need to make the right decision in less than five minutes. Amazon is an Internet pioneer that changed the way the world buys books. Most Mom & Pop and big box bookstores are long gone. And, now Amazon is a marketing juggernaut that sells an incredible range of goods and services over the Internet. Amazon may be on to something. There are 78 million boomers and seniors who are increasingly computer savvy. They also have no interest in Black Friday shopping hours or standing in long lines. They have already had their nightcaps and are sound asleep dreaming of their next vacation in Hawaii. Generation X’s and Y’s are a lot more computer literate than their parents and grandparents. They appreciate the Internet’s convenience, unlimited choices, increasingly quick deliveries, product reviews, and quality ratings. They are the ideal buyers for Cyber Monday marketing campaigns. And, as their purchasing power goes up so will the impact of Cyber Monday.